Advantage Rental Center's propane filling station is open Monday through Saturday from 7am to 5pm. We do not exchange or “swap” your tank for another. We fill your tank. By having your 20 lb propane tank (standard BBQ size) filled at Advantage Rental Center, you know you're getting a full tank. 20 lb tanks are designed to take twenty pounds, give or take a pound or two depending on ambient temperature. If the outside temperature is cooler, the tank will accept more propane; if the temperature is warmer, the tank will accept less. Also, the tanks are designed with extra space to accommodate an additional 20% of expansion if the temperature rises. Many of the popular tank exchanges only give you 15lbs of propane, not the 20lbs your tank is designed to take. You don't get your own tank back. You may end up with a much older tank, sometimes even older than 12 years if the tank has been re-certified. Is Your Tank Still Good? 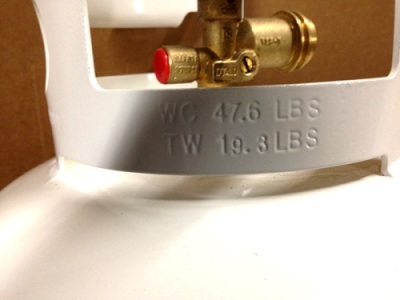 20 lb propane tanks are good for 12 years from the date of manufacture. 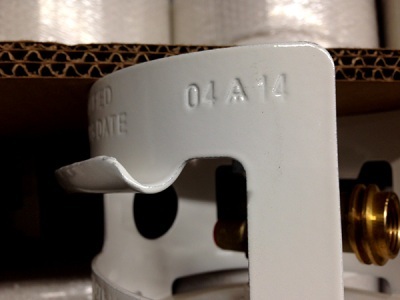 You can check the age of your tank by looking for the 4 digit date stamp located on the tanks collar. In the example given, the tank was manufactured in 04 14, or April of 2014, and would expire at the end of April 2026. If the tank has been re-certified, then it is good for 5 years from the re-certification date. Re-certified tanks will have a sticker on them showing the re-certification date. We can only fill tanks that are free of excessive rust and dents or dented welds. Tanks must have a protective collar, foot ring and upright gas valve. Tanks must also have an OPD Valve. Tanks must also have proper a “1075 Flammable Gas Label”. If yours is worn or missing, we will provide one at no cost to you. We will also provide you with a protective dust cap for the valve opening at no charge. Not Sure If Your Tank Is Empty? It is not uncommon for our customers to bring tanks in for a refill, only to find out the tanks still have an adequate amount of propane in them. One of the causes of this is that they inadvertently tripped the OPD (Overflow Prevention Device). This can occur at times if the valve is opened too quickly. One sign the OPD may have been tripped is very low gas flow to your BBQ. If this occurs, shut both the BBQ and tank valves. Disconnect the tank from the BBQ and allow it to rest for a few minutes. During this time the OPD should reset (there won't be any visual indication that is has). Reconnect the tank to the BBQ, and open the tank valve as slowly as you can at first. Once you hear the line charge, then you can open the valve the rest of the way as you normally would. You can also determine the amount of propane remaining in your tank by weighing the tank and subtracting the Tare Weight. The Tare Weight is the weight of the tank when empty. Tare weights can vary by tank and manufacturer, and can be located on the tanks collar. It will be designated by TW follow by a number. In the example provided, the Tare Weight is 19.3 lbs. If your tank is expired or unfillable for another reason, you can drop off your tank for disposal at no charge to you. Sign Up For Our Newsletter And Receive Discount Coupons And Info On Seasonal Specials. © 2007 - 2018 Advantage Rental Center. All Rights Reserved.